Hometown and current residence: Fox Chapel Borough of Pittsburgh, Pa.
"Point Park has provided John with a well-rounded knowledge of business and marketing. Additionally, by allowing John to do a co-op, it has provided him more time with us to further develop his skills and integrate him into our team." "The co-op program in the Rowland School of Business is a great opportunity for students to gain real-world experience while still getting the credits they would if they were in the classroom." Tell us about your co-op and how you landed your position before graduating. 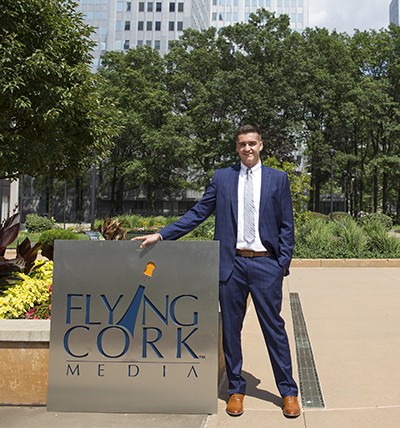 Initially, I landed an internship at Flying Cork Media in Downtown Pittsburgh. One of Flying Cork's clients needed someone on site to fill in and handle their various marketing activities. I was only supposed to be there a few weeks, but I ended up being a good fit for the position and Jude (my boss) told me the position was mine if I wanted it. Not only do I have a job in place after I graduate, but I was also able to turn the work I am doing now into a co-op. Why did you select Point Park's business management major? I selected Point Park University's business management program mainly because business is something that has always sparked my interest. Looking at my father as a role model, I knew I wanted to do something in business, but I just wasn't sure what. Eventually, I found out I really liked marketing and Point Park offered great marketing classes that hit on all of my interests. What are your key responsibilities at Flying Cork Media? On a daily basis, I am responsible for handling a majority of the internal and external marketing initiatives for our company. I manage the social media accounts (Facebook and Twitter) for three separate business entities (including companies that have products in Walmart, Target, Home Depot, Petco, etc.). I also do market research and ad buying through the use of Google AdWords and social media platforms such as Facebook Advertising and Pinterest Advertising. Additionally, I work with Paula Deen Ventures and their social media team on a regular basis, handling the advertising for a line of their products our company has developed for her. I project manage numerous projects including landing page design/creation, advertising initiatives and the building of a television show. I will be traveling in the upcoming months to handle the marketing initiatives for a television show called "Tomorrow's World Today" which will air on Discovery's Science Channel this fall. I also work with a client who has recently begun offering STEM/STEAM curriculum to schools in Pennsylvania and the surrounding areas. It is exciting being a part of something that has the potential to spread across the entire country. I help advertise for this client and manage campaigns for them via social media (giveaways, promotions, etc.). I am also their main point of contact for media interview requests. Lastly, I am responsible to be on the lookout for new marketing opportunities. I also help organize events, product photo shoots and videos with our CEO. I attend marketing meetings daily where I collaborate with different teams, providing them with marketing strategies and insight into best practices. What advice do you have for our students who are considering doing a co-op? The co-op program in the Rowland School of Business is a great opportunity for students to gain real-world experience while still getting the credits they would if they were in the classroom. I highly recommend taking advantage of the program by finding a position that interests you and relates to your major. Mainly, I can't wait until I no longer have to worry about school work (LOL!). Balancing my actual work load here at Flying Cork Media with the classwork load is a bit challenging at times. I am also looking forward to the marketing concentration classes I will be taking in the fall.